Parklet outside the Green Line Cafe at 43rd and Baltimore Avenue. Lowly in-street parking spaces across the city are slowly being put to a higher purpose as public spaces. These parklets - featuring seating areas on raised platforms blocked off from traffic - are like an extension of the sidewalk, providing new places to sit, read, or watch the world go by. 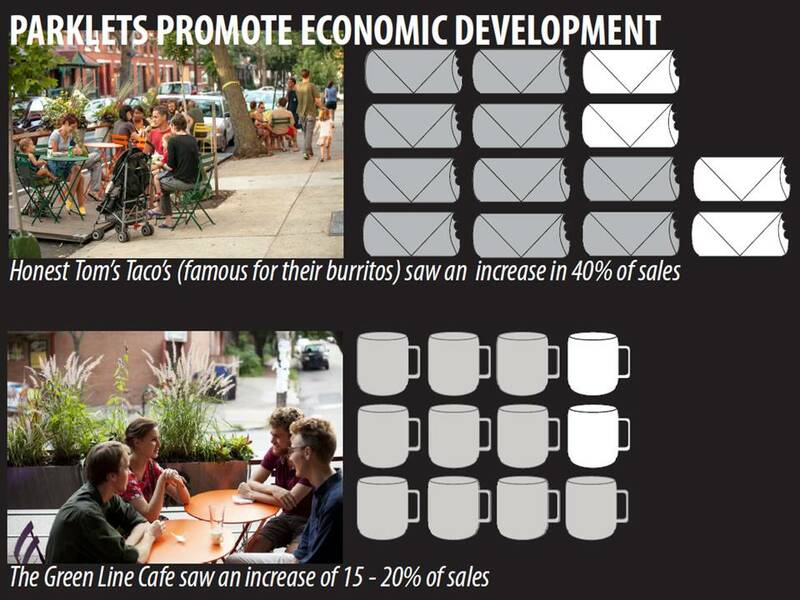 Our parklets enrich street life and have helped boost sales for the businesses where they are located. Since 2011 six parklets have been added to Philly streets, and now the Mayor's Office of Transportation and Utilities has issued its 2013 call for more. So far Univeristy City has three parklets, but they can also be spotted on Frankford Avenue in Fishtown, South Street West, and Wagner Avenue in Logan. Next up: 10th Street in Chinatown. Last year's crop of parklets were spurred along thanks to grants of up to $5,000 from MOTU. This year there is no such grant offer on the table, but we hope MOTU might open up another grant round to sweeten the deal. Parklets are still a pretty new idea around town and I imagine that the financial assistance will make parklet projects feel less risky for community groups to explore. If you think your neighborhood could use a parklet, or if you'd like one ouside of your business, check out the 2013 Parklet Guidelines [pdf]. Community support for the proejct is essential, as is the ability to maintain the parklet once built. Anyone interested should contact MOTU’s Ariel Ben-Amos via email for further information.